It’s a certainty of parenthood that your child will need to use the restroom after you’ve left the house, after you’ve driven past the toilets, after they’ve assured you – many times – that they didn’t need to go. Road trips? They’re like bran for our little ones. But this doesn’t mean you need to invest in deodorizer and upholstery cleaner. Rather, invest in toilets for your travel. Why Buy a Travel Potty? A travel potty is helpful for several reasons. To start, they let your child go when no restrooms are nearby. They’re easy to use (with disposable bags) and easy to transport. Even if you’re traveling in an area with lots of public toilets, they may be a more attractive option. On one hand, they’re not as big as regular toilets, making them less scary in the eyes of a child. On another, they’re not filled with germs. Don’t think public toilets are gross? Wait until you look down to find your child licking the lid of one. This toilet comes with a contoured seat to foster your child’s comfort – bring some books, they might want to stay here a while. It is designed to work in cars, boats, RVs, or when camping. It can work as a standalone potty or convert to a potty seat to use on a regular toilet. In the pros column, the toilet folds flat which makes it easy to transport but also prevents it from taking up too much space (you can carry it in your diaper bag). 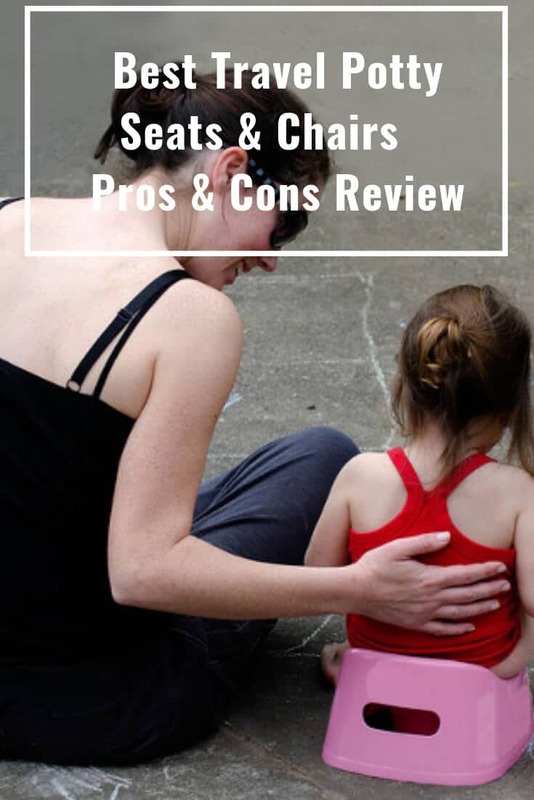 It’s also sturdy with a focus on balance, helping your child to feel secure as they go. And it offers a generous weight limit – up to fifty pounds. In the cons column, the seat lacks stability when placed on a standard toilet. The legs may also be difficult to snap in place. Leaving a child waiting isn’t ideal when they’ve just consumed fourteen juice boxes. This potty is compact and ready to assemble quickly (it comes in only two pieces). It also comes with five disposable liners (with absorbent pads) and 20-pack refills available for purchase. The pros include its versatility – toddlers to big kids can use it. And, while you can buy specially made liners, plastic bags work too. The toilet is easy to carry, easy to use, and takes up very little room. No need to make your husband sit in the backseat so the toilet can ride shotgun. The cons include its versatility (yes – it giveth and it taketh away). While older kids can use it, a few parents have found that children with larger posteriors might struggle with the size. Getting the bag in the proper position has also proved trying for some. This product is designed for on the go potty emergencies. It works as a standalone potty or as a potty seat on a regular toilet. It comes with disposable plastic bags but can be used with standard bags as well. The good news is this potty is simple and opens quickly, something you certainly want for the child just learning to battle their bowels. The leg functionality is a nice addition, as is the travel bag that’s included. The bad news is the splash guard: it’s short, which means it might not work as well as desired when used by boys who have not yet perfected the art of the aim. The potty isn’t as secure on top of a toilet as it is on the ground, either. This product is lightweight, but durable. And it folds up to the size of a small briefcase (think of it as a briefcase for your child’s “business”). Use it with resealable bags – seal tightly, you’ll be glad you did. On the pros side, this potty is very easy to carry and store. It’s small enough that it can be used inside a car (for optimal privacy). You don’t have to buy liners, either: the potty comes with Zip-loc like bags. This makes cleanup quick and simple. The storage compartments are another pro – use them to store an extra change of underwear for your kid or a hidden travel mug of coffee for yourself. On the cons side, the storage compartments are difficult to open (which might be a good thing – you don’t want your child drinking your coffee). The seat is also flat and may be unable to block pee every time. This toilet is especially designed for travel (and, sadly, not for use in swimming pools). The inflatability makes it particularly portable and easy to carry in your purse or diaper bag. The above acts as a pro, of course, but it also fosters comfort, turning this into a potty that your child will enjoy using (and, therefore, want to use). The bright colors also attract little ones. You can customize the cushion to your child’s preference, blowing it up fully or just a little. But, alas, inflation comes with negatives as well. There is always the risk of a hole – the more you use it, the more likely it is that the material will spring a leak. And, if you don’t keep it inflated, your child will have to wait for you to blow it up before they can go. Patience is a virtue, but not when poop’s involved. This potty seat has an owl design, making it something your kids will enjoy (who doesn’t love to pee on an owl?). It easily switches between a foldable and un-foldable design. It also comes with a waterproof carrying case. The perks of this seat are the silicone stoppers – they prevent it from sliding around. It’s also better than average for boys. The extra space is ideal for kids learning to aim. The seat won’t unfold on its own, either: there will be no collapse mid-stream. The drawbacks are the nooks and crannies: there’s lots of them. This makes the seat difficult to fully clean. The travel bag is also hard to keep clean: it allows germs from the seat to reach the outside of the bag. If you’re anti-germ (as most parents are), you might opt to purchase a separate carrying case. This toilet seat contains a magic word: antimicrobial, which means it kills microorganisms and stops their growth. It’s also machine washable and dryer safe. The above are certainly pros for parents. Other pros include the design and concept – they’re unique and innovative. The seat offers a comfortable experience for your child and a wet/dry storage pocket for you to use. If you don’t think you need a wet storage pocket, then you haven’t been potty training long enough! In the not-so-awesome column, the concept – while great – isn’t always perfectly workable according to some parents. The biggest issue is the splashguard: it protrudes out far. For some parents of boys, this creates a hazard. It may scratch some children or serve as an obstacle for others (“Splashguard?” Try “splash back”). Do you want your child to use the toilet with confidence? This potty seat can help! It is designed to improve cleanliness and help kids avoid direct contact with germs. It’s geared towards kids between one and six and made with non-toxic, safe, and odorless food grade ABS material. 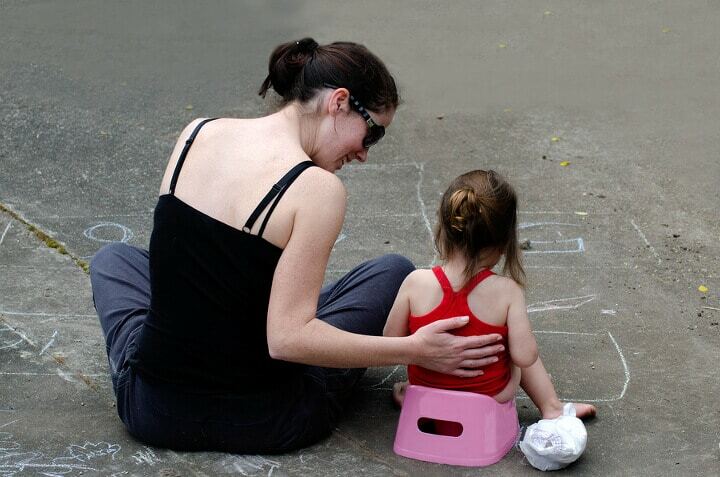 Save the planet as you potty train – multi-tasking at its finest! The biggest benefit of this seat is that it works well on standard toilets, helping children who wouldn’t otherwise use them. It’s also easy to carry, fitting inside a regular diaper bag. You can take it with you grocery shopping! The biggest drawbacks are: it may not sit entirely level at first, requiring some adjustments and it sometimes slips around. Looking for a roadside toilet is the bane of all parents – it’s not a matter of if your child will need to go, it’s a matter of how many times. The above portable potty seats and chairs allow your child to go at their convenience and your convenience too.